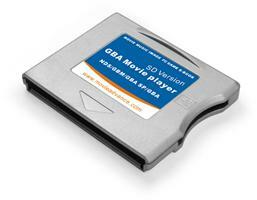 GBA Movie Player(SD version) How to use? Pls refer to the following steps: 1. Put the driver CD into your CD-Rom drive and install the conversion software and codec pack 2. For movies, music and images, you need to convert them with the conversion software. After conversion, the movie will be converted into a set of gbm and gbs files (gbm for video, gbs for sound); Music will be converted into gbs files; images will be in BMP files. For Ebooks, TXT files are supported directly. GB and GBC games under 200K can be played as well as GBA roms less than 256K . 3. Put the converted files into the GBA Movie Player's SD slot, and then plug the SD Version into GBA/GBA SP/NDS/GBM. Turn the GBA/GBA SP/NDS/GBM on and enjoy the fun!